I am waiting for batting to arrive in the mail so...you know...why not start another new project, right? I happened to be in my box of Anna Maria Horner's Little Folks voile a couple of weeks ago and it's almost like I forgot how silky and soft the fabric was. I decided not to let it just sit there and get lonely, so I started cutting. 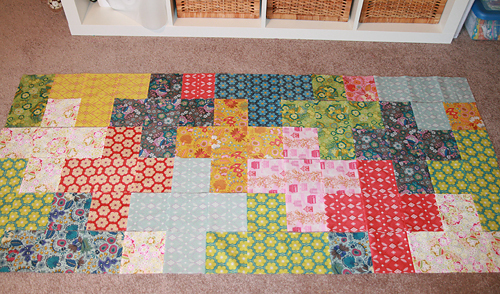 Lots of squares. 182, 5" squares to be exact. Laying this one out has been quite fun and it's coming together quickly. A little over half the rows to go. 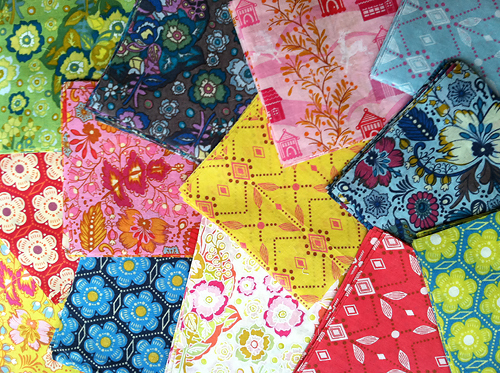 I will be leaving Thursday for the International Quilt Festival in Cincinnati. I'm not sure if I will blog before that so if not, I will be back shortly with a full report!